Serguei Netessine is Vice-Dean for Global Initiatives and Dhirubhai Ambani Professor of Innovation and Entrepreneurship at the Operations, Information and Decisions Department at the Wharton School, University of Pennsylvania. He lived and worked in Russia, USA, France and Singapore. Prof. Netessine received BS/MS degrees in Computer Science and Electrical Engineering from Moscow Institute of Electronic Technology and, after working for Motorola and Lucent Technologies, he also received MS/Ph.D. degrees in Operations Management from the University of Rochester. His current research focuses on business model innovation and operational excellence and he worked on these topics with numerous government and Fortune-500 organizations including Federal Aviation Administration (USA), Government of Singapore, Lockheed Martin, Procter & Gamble, McDonald’s, Rolls Royce, Comcast, Expedia, ABB and US Air Force. He serves on advisory boards of multiple startup companies and he is an active angel investor. Prof. Netessine also regularly participates in industry and government-organized forums on Innovation and Entrepreneurship, including World Economic Forum in Davos and World Knowledge Forum in Seoul. He was a member of the "Future of the Economy" committee for Singapore Government. He is a founding member of the Network for Responsible Research in Business and Management. Professor Netessine has been the recipient of several teaching awards for delivering classes to MBA and Executive MBA students at the Wharton School and INSEAD, and he frequently teaches and directs Executive Education Programs, including teaching in Massive On-Line program for Microsoft (10,000+ participants). Prolific academic writer, professor Netessine holds senior editorial positions at several leading academic journals and he co-authored dozens of publications in prominent management journals, including Management Science, Marketing Science, Operations Research, Harvard Business Review and other. His work has received extensive media coverage in CIO Magazine, The Economist, Forbes, Huffington Post, Multichannel Merchant, New York Times, US News, Business Standard and Strategy & Business and other press. He regularly blogs about innovation on http://www.renaissanceinnovator.com and HBR Network. 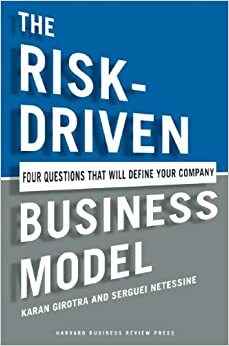 His latest book "The Risk-Driven Business Model: Four Questions that will Define Your Company" was published by Harvard Business Press in 2014. It received 2015 Axiom Business book award for "Business Theory".